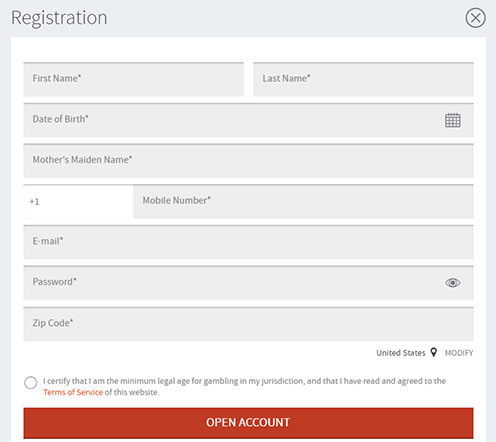 Bovada Poker accepts players from the United States. That’s right – real money online poker from within the US! This is not a carbon copy. The software was developed by and is completely unique to Bodog/Bovada. Play instantly from any mobile device or tablet – iPhone, iPad, or Android device. Only play against other players on Bovada – they do not used a shared network. You never know who you’re playing against at Bovada. All tables are 100% anonymous and player names are never shown. Your funds are always safe at Bovada with start of the art encryption built into the software. 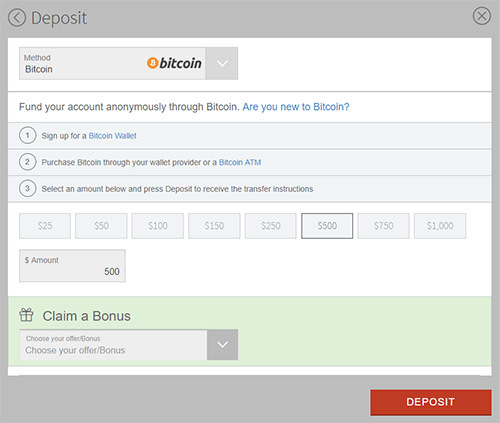 Bovada accepts credit cards (Visa, MasterCard, Amex), along with Bitcoin, to make deposits. All new poker players receive a $500 Bovada poker bonus when making their first deposit. Start your online poker journey by starting the Bovada Poker download now! 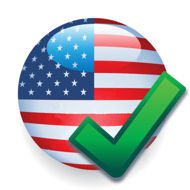 Rememember, Bovada Poker accepts players from the United States. Note: Bovada does not accept players located within Delaware, Maryland, Nevada, New Jersey, and New York. In just a few steps, you will be playing online poker for real money, against real people, and earning a real bonus! Simply visit Bovada.lv to start the account creation process. All you need to do is enter your email address, create a password, and a few personal details. Note: If you prefer, you can also skip this step and deposit directly within the Bovada Poker client once it’s downloaded and installed. Once your account is created and you’ve made a successful deposit, you should start the Bovada Poker download from their website. Once downloaded, it takes only a few minutes to install and then you’ll be up and running! You’re now ready to go! Open the Bovada lobby and choose a table. Remember, all new players receive a $500 bonus on their first deposit. Our Bovada Poker bonus code review goes into greater detail on earning and clearing the bonus. 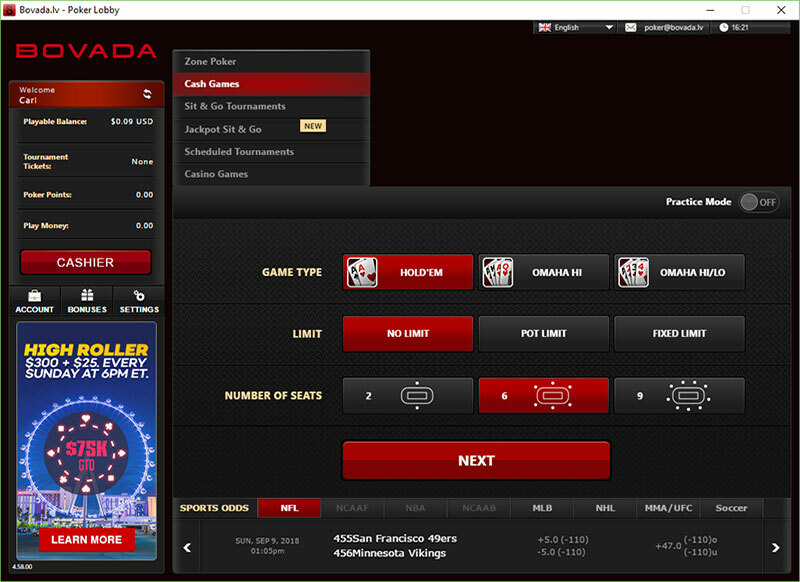 The Bovada Poker download only takes a few minutes to set up and install. Download now to receive your free $500 from Bovada! 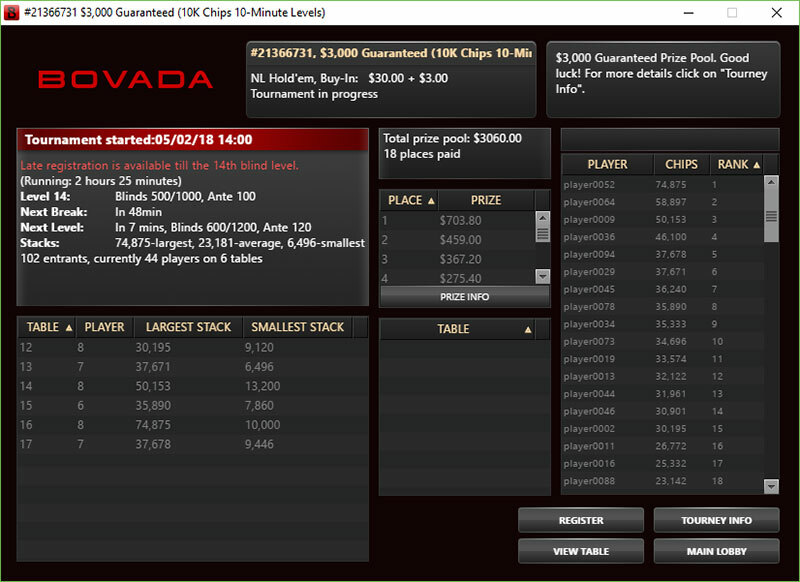 The Bovada Poker software is top notch. It was originally developed over a decade ago as a clunky newcomer to online poker – Bodog. However, over the years, Bodog & Bovada really stepped up their development and began to release new and innovative features while at the same time maintaining a simple, minimalist, and easy to use product. 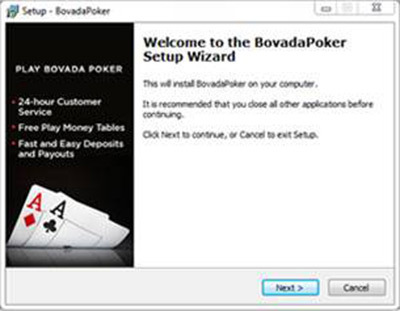 Bovada is offered as a downloaded desktop client which is currently only available on Windows. (Sorry Mac users.) There is also a mobile friendly version available, which can be played on your phone’s browser. By far the best aspect of the Bovada is how intuitive it is to use. After installing and opening it for the first time, it is broken into simple categories based on what kind of game you’re looking to play. If playing cash games, you don’t have to worry about finding a table. Simply choose Cash Games, which game you’d like to play (Hold’em or Omaha), stakes you’re comfortable with, and table size, then within seconds you’ll be seated at a table. No need to browse through hundreds of tables to find one. Bovada simplified the seating process making it as convenient as possible for the players. 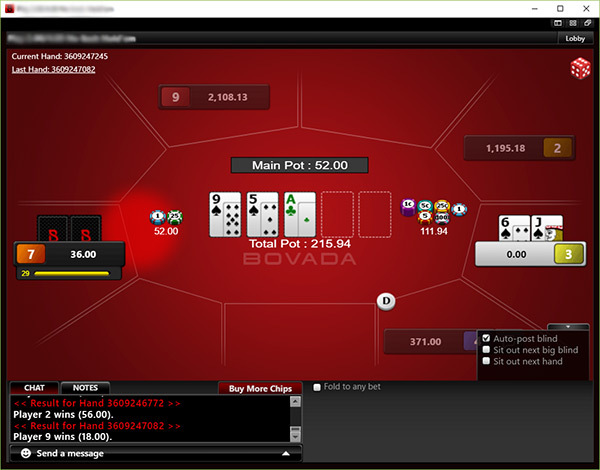 Players can join as many tables as they’d like, and Bovada has many features available to make multi-tabling easier. The tables and betting options are laid out as you’d expect. Betting/raising are simple, and it’s actually pretty quick to use only the keyboard to save time, rather than clicking with your mouse. Everything feels smooth and of high quality, making it easy to follow along with the action. 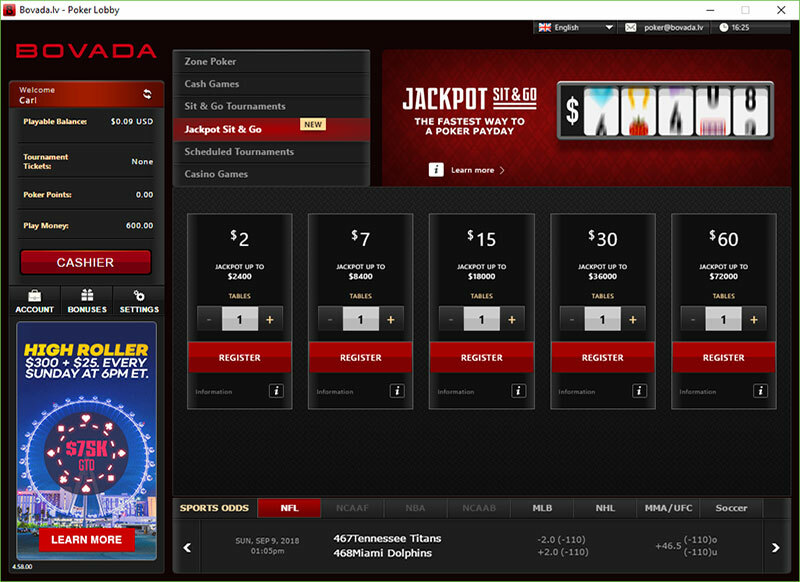 Bovada certainly is not clunky or poorly designed as you may be used to on other pro-US sites. There are some unique/fun settings you can enable such as fold and show, all-in percentages, and rabbit cards, if you fancy. Basically, any computer purchased after 2012 will meet these requirements. 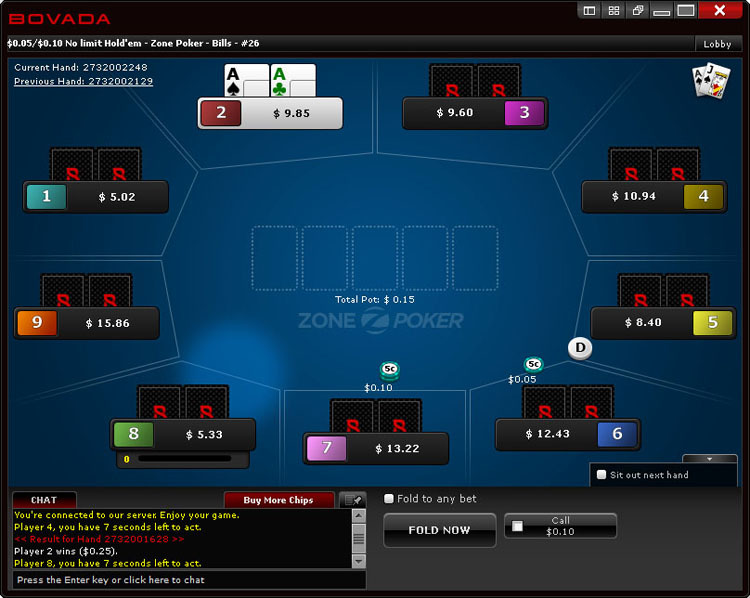 Bovada keeps track of every hand, just like other online poker rooms, using hand histories. You can access your hand histories directly from the table you’re playing at instantly by clicking on “Last Hand” in the top left of the screen. 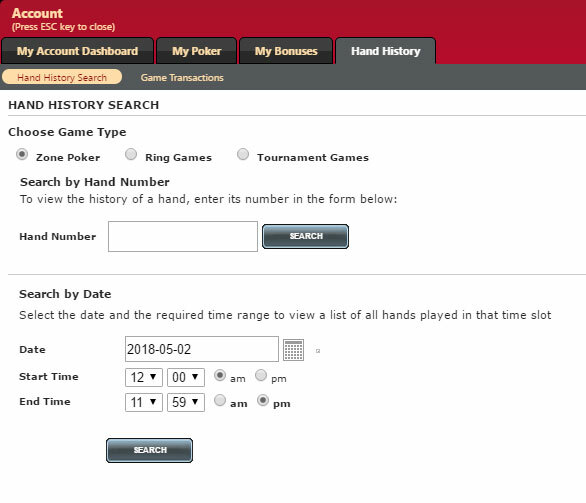 You can also find previous hand histories via the poker client by clicking on My Account – Hand History. By performing a search, you can also download these hands to use within Poker Tracker and to post for discussion in strategy forums. One of the most unique aspects of Bovada is keeping everyone completely anonymous. You won’t see usernames like on other sites, instead, everyone is just referred to as Player1. Player2, Player3, etc. This means you won’t be able to keep track of players or know who you’re playing against in any fashion. If regular poker isn’t fast enough for you, load up Zone Poker. 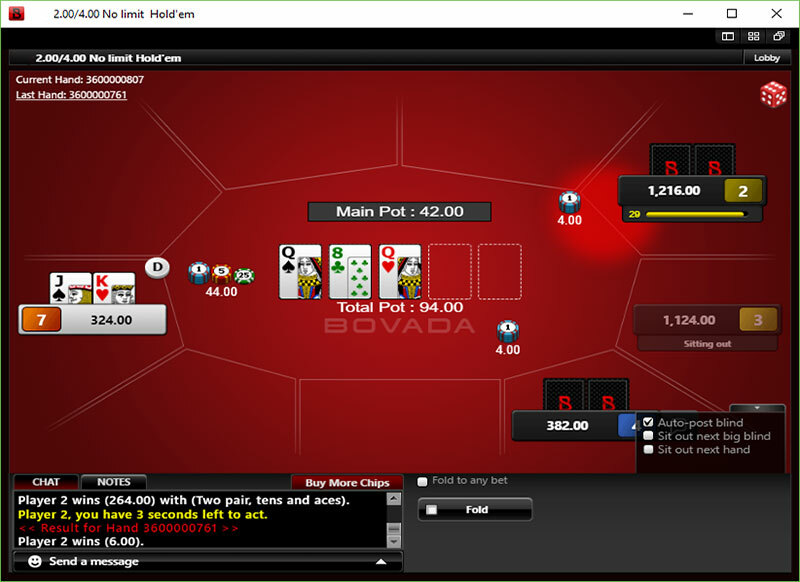 This is Bovada’s fast play version of poker which allows you to play around 3-4 times as many hands as a standard table. The way it works is you join a pool of players, rather than sitting at one table with the same players. When you fold, instead of watching the hand play out and waiting for the next hand to be dealt, you instantly move to a new table, with a new hand, with a different set of players from the pool. It allows you to pass on the boring/weak hands and brings a lot more action to your game. Also, since you’re playing more quickly, you see more hands per hour and therefore will clear the bonus at a much faster rate. Bovada offers a fully compatible mobile poker client which you can access directly on their website. Simply visit https://m.bovada.lv/poker from any tablet or mobile smartphone. Note: There are no Bovada mobile apps available to download and install for any devices. You won’t find anything by searching the Google Play or the iTunes store. The only way to play from your mobile phone or tablet is to visit Bovada directly. 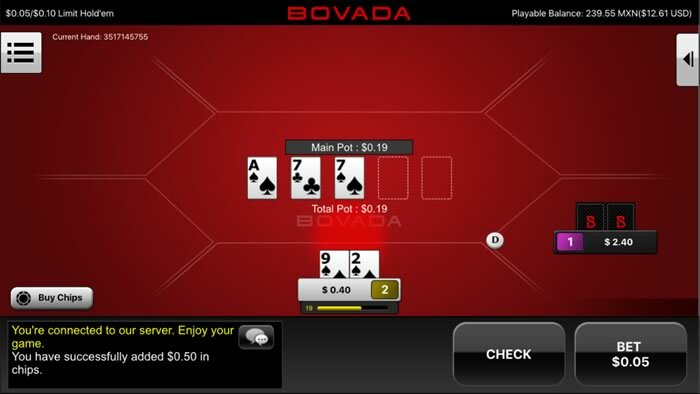 The Bovada mobile poker client is designed to work with any screen size or device. We tested it with everything from older iPhone’s and Android tablets, and there was never an issue. 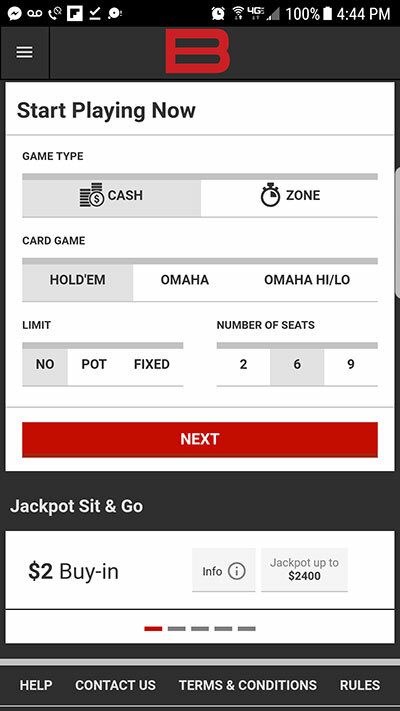 The mobile lobby is much more simplified than the desktop client and only support cash games (both regular and zone poker) and Jackpot SNGs. You cannot play standard SNGs or any other tournaments via mobile. By playing on mobile, you still access the full player pool. It’s not difficult to play once you’re at a table either. In fact, the bet slider at the tables is among the best bet sliders to be found in any poker software whether desktop or mobile. Unlike most bet sliders, this one allows you to easily select a value that’s appropriate. The way it does this is by making the same distance on the slider represent different changes in bet size. For example, if you’re considering making a smaller-sized bet, you’ll need to move the slider a noticeable distance to increase the sizing by one big blind. On the other hand, if you’re betting a larger amount, even small movements in the slider will produce big changes in the value of the bet. The buttons are placed in a way to make all of your actions easy with very little chance of misclicks. Everything is very intuitive and easy to use, making it one of the best mobile poker options today, and certainly the best for US players. 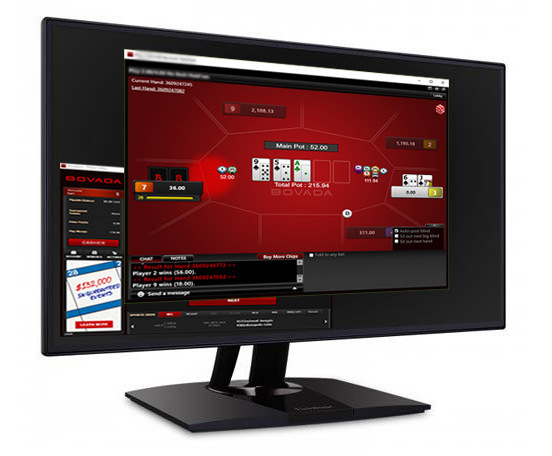 The Bovada Poker download is lightweight, easy to use, and has the best software we’ve played on. Bovada has spent years and millions of dollars perfecting their software and brand. 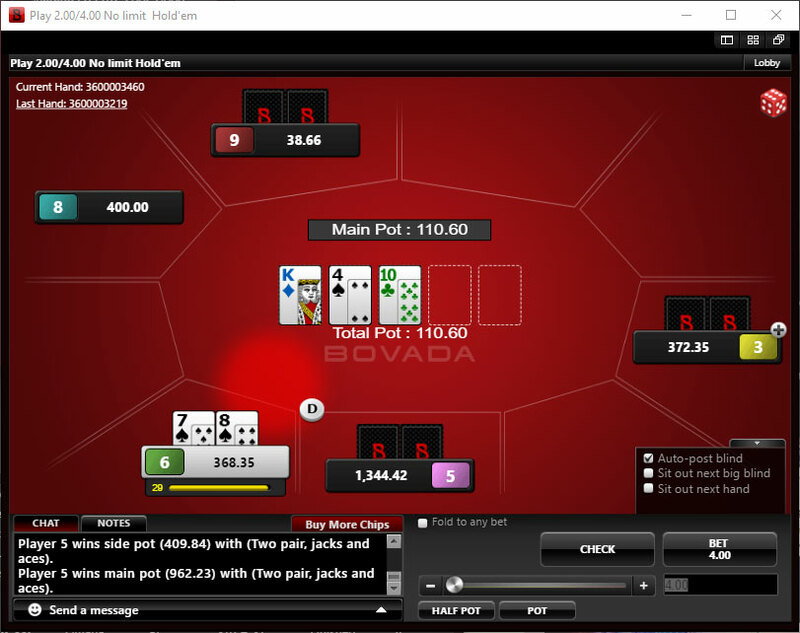 If you’re in the United States, you can’t go wrong playing poker at Bovada! Start the Bovada Poker Download now! Hopped on a cash game on my iPhone while waiting for wife to finish shopping. Worked awesome, was a lot of fun. Now I have something to do when we go to the mall lol! Get the latest Bovada Poker download here. Find other free poker downloads at PokerCasinoDownload. Our UK and European visitors can visit http://www.poker-bonuscode.co.uk for the latest poker deals. We also recommend checking out RedeemBonusCode for more UK poker, sports, and casino promotions.